Reading a book for me isn’t rocket science, but I never knew how hard it was to create a book until it was a requirement in my third grade class. Entering different stages education-wise, reading and writing have gotten very difficult. I knew I was capable of being successful at accomplishing the assignment. My concern has always been a struggle starting an introduction. It wasn’t just my doubt about the topic. I also had to draw out pictures based on the story. Over thinking assignments I tend to have nervous breakdowns and often have the urge of giving up too easily. The moment the assignment was given I completely panicked. There were so many emotions and thoughts running through my head I didn’t know what to think or how to feel. I found myself engaging in other activities knowing I had to focus on my book. The project was intimidating, but I was excited and nervous about it because I have never done anything like this before. My story was based on my family living in a haunted house, so the images I wanted to put into my book weren’t as difficult as I thought because I’ve gotten an idea about what my topic was going to be about. There were hundreds of kids that attended the school I did in Hartford CT. I had just moved there from Windsor CT, so I didn’t know much about the town. Being a new student at Thirman L. Milner Elementary was frustrating for me to communicate with people I’d never spoken to and adapt to a new surrounding. Every student had to take a test to be placed in a specific classroom, so for the first couple of days I didn’t have an assigned classroom. Holding off my project was not a good idea, but the best part about it was my classmates got to work on it in class, out loud and in group discussions. My teacher gave me the option of getting a passed due grade, which was extremely important and made me want to focus on the assignment. Receiving a pass due grade meant that I’ve gotten a late grade. After cautiously presenting it in front of my classmates, I have never felt so relieved in my life. While I watched everyone raise hands, clap and shout questions, I realized how unnecessary it was to feel the way I did. I made a personal goal how to overcome my smallest fears. Next time I knew to hand an assignment on time. I thought I did great but could have done much better than what I expected. Mrs.Novick was my favorite teacher, but I felt the assignment was asking too much. I appreciated her class because she made school fun for me. Trying to accomplish this project got me so frustrated I couldn’t help but to put a guard up. She constantly gave great advice to build her students’ confidence and that helped motivate me. That was a very difficult time and I needed someone to talk to, so I had sat down with my teacher to express my feelings about the assignment. Mrs.Novick understood how I felt. She shared some of her personal life experiences, and that made me feel special. I thought she was a generous teacher and actually cared for her students. I looked forward to going to school when I knew we had a discussion on our project and listening to everyone’s ideas gave me multiple thoughts on how creative I wanted my book to be. Walking the halls of Milner Elementary, which I thought were spooky, always seemed to amaze me. The school was so huge it could have been mistaken for being a high school. The walls looked so pale and the vibe it gave me reminded me of what a scary movie was like with a little girl walking around her dark home at night. However, my classroom was the complete opposite. It was very colorful like a summer dress. It had multiple computers and different learning areas around the perimeter of the class. One of the learning areas was the color hot pink. This color always seemed to draw my attention and still to this day it does. It was my favorite color. Every day I sat on that side of the room. It made me feel pretty. When winter arrived I’d always feel like the season is spring because that color made me feel sparkly and relaxed. Even to this day my feelings for writing have grown in different ways. I know handing my assignments in on time and starting a rough draft when it’s given I’m bound to get a higher grade rather than slipping back to my old ways and allowing myself to rush on assignments that are due within a couple days. Chattering was a problem I had when I was a kid. Now I distance myself from distraction because my mom always told me “Your friends aren’t going to pay your bills,” and that is a quote I live up by. Thinking about how much effort I put in disrupting my class by “chit chatting,” as Mrs Novick would say, could have been time I put in to complete my project on time. Completing my book at the last minute was a huge surprise to me because of the grade I received. I did extremely well. Creating my first book in third grade has impacted my mind set and how I think of things differently now. This experience taught me anything is possible and never give up too easily. This task has made me think about my daughter’s future when she reaches third grade and may have to achieve something like this. I would tell her it’s better to start an assignment before it’s due, so you can brainstorm multiple ideas and have a higher chance of getting a better grade than I did. Starting my book at the last minute trying to add as much detail as possible was unfortunate but I’m satisfied with the B- I got than a zero on something I knew I could do. It felt amazing hearing everyone’s positive feedback and that motivated me to always hand things in on time and complete every task given. Instructor Comment: What I love about this Literacy Narrative is the amount of self-reflection Ashley does. Not only does she reflect on her process at the time, but also the significance of the experience to this day both for her and her daughter. 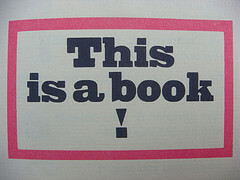 Photo Credit: “This is a book!” by Nick Sherman. Licensed under Creative Commons.